Is it abandoned? no. Is it on vacation? no. I've been terribly busy and have had no time. 2. Connect Pestel to Baie de Henne to make the gameplay a bit more circular. 4. Make both Nord and Ouest into +4 thus making the map a bit more interesting with harder to hold bonus areas and preserving the north-south balance. 4. changed red to +5 since added new defending route and it touches so many territories and continents. 5. new font for the small map so it's readable now! a. like the new bonuses? b. like the new attack routes? I have two issues with the red region. 1. I'm not sure it's worth +5. It won't be that much harder to hold than Nord. 2. "Oest" means "west" yet this region is in the East. For that matter, "Sud" means "south" yet that region is in the west. And "Centre" really isn't in the center of anything. 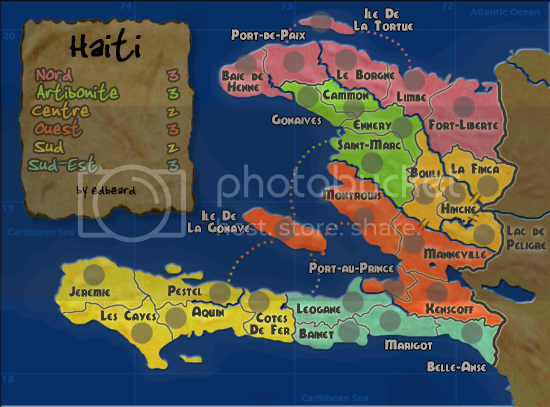 Is this what they call these regions in Haiti? Because if so somebody needs to buy that country a map. edit: I see that these are the local terms. whack. oaktown wrote: I have two issues with the red region. Nord only touches 3 continents with 5 territories attacking it. Ouest touches four continents with 6 territories attacking it. It also balances the North from the South since to hold the south you need to hold four territories. Whereas the North only require three territories to hold it. I'd like to hear more thoughts on the bonuses though. edbeard wrote: Nord only touches 3 continents with 5 territories attacking it. Right... but Ouest also has one fewer territory, so while it will be harder to hold it will be easier to take. edbeard wrote: It also balances the North from the South since to hold the south you need to hold four territories. Whereas the North only require three territories to hold it. I'd say that even with the extra border the South may have the advantage. If you start in south it's an easier road to one or two bonuses than if you start in the north, because the little southern bonuses are in the corners where they're easier to conquer. Centre the obvious first region for a "northern" start - is in the thick of things and will be a rough place to start. edbeard wrote: I'd like to hear more thoughts on the bonuses though. Agreed. Let'sget some more voices in here and if folks like the current bonuses I'll stamp it. i have to admit that north versus a slightly stronger south isn't something that i saw immediately. one might be tempted to merge two of the nord territories to alleviate this by giving to the northern player an easier start or expansion. however, it's possible that this is not so much of an issue in actual 2-player games, where neutrals are a major factor. i think the +5 bonus for ouest is exactly right: not only can it, like the scotland map's strathclyde continent, be attacked by every continent except one (so it's bound to be beside a hostile neighbour), but ouest's position means that there's only one north-south route that does not involve attacking through it. I think the bonuses are good as they are now. I haven't looked into the specific details of each continent, but at first glance they look ok.
Good going edbeard - I'd say you're getting close to some stamps! I really like your ocean routes - the blend of colours is a sublime touch! I'm pretty certain that you intend to have Limbe and Ennery bordering each other, due to the thinner river(?) there... perhaps it would be worth putting in a bridge over the border to make it more clear that they can attack each other. The Ile De Gonave is a pretty strategic territory - the kind of place you want to be building on in an escalating game! Having said that, the fact it links all the regions together makes it pretty vulnerable too, so I'd say leave the Ouest at +5. The only things that bugs me (for no logical reason) is the gap at the bottom of the map... You could shave about 1cm off the bottom (to just above the 'Caribbean Sea' text) and not lose anything. All-in-all, I'll say again that you're surely not far away from your stamps now! hi edbeard....haven't seen this in a while, so i hope i don't go over anything that has already been covered. Are you going to show anything in the legend. I think it would clarify some of the dark blue lines. Also, i can see that the thickness of the region borders could also be mis-interpreted as rivers. With the quality & colours you've produced here, I'm going to open Pandora's & recommend that you take on the Brazil revamp. Mr. Benn's suggestion of the sea route change is an interesting one. My only problem with it is that it prevents the owner of the Artibonite continent from taking over Port-de-Paix to make the continent only a 3 border one. NB: the sud-est continent is like this as well. I'd rather not make the Artibonite that much harder to hold. Perhaps I could make the Cammon territory not border Port-de-Paix and do the sea route change. I think the thickness difference and the style of the river vs the style of normal borders (thick blue line vs a thinner line with a glow around it) is enough to distinguish between them. I don't think putting them in the legend is necessary as impassables should be known especially when there's bridges elsewhere. From all the maps I've seen, it's actually two river sections (perhaps a man made gap put in between?) and therefore a bridge isn't what it really looks like. Though, putting a bridge in would alleviate any argument that we need to show the rivers as impassable in the legend, and I've made a couple changes from reality already (moved the borders of districts to help with gameplay (specifically one I can remember is the Ouest border matching the river (it doesn't in real life))). At the same time though, is one more change like that going overboard? I'll think about this more and see what other people say about it. Uniformity certainly helps alleviate any questions. I suppose I could take off the bottom of the map, but the space between 20 degree line and the top of the map is the same as the 18 degree line and the bottom of the map. When you also consider that this map is much smaller than the limits and that almost every map goes to 800x800 nowadays, it doesn't seem like a necessary or a particularly helpful option. Impassables are up to you ed....but i get ask to show them all the time for non-confusion. cairnswk wrote: Impassables are up to you ed....but i get ask to show them all the time for non-confusion. edbeard wrote: Mr. Benn's suggestion of the sea route change is an interesting one. My only problem with it is that it prevents the owner of the Artibonite continent from taking over Port-de-Paix to make the continent only a 3 border one. NB: the sud-est continent is like this as well. 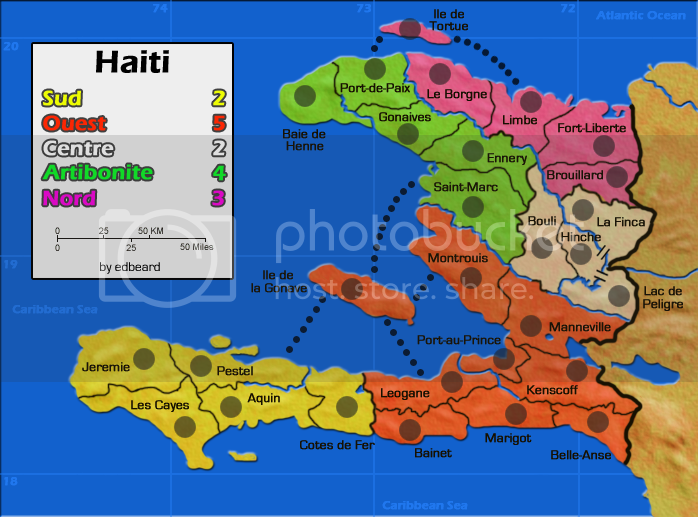 I'd rather not make the Artibonite that much harder to hold. Perhaps I could make the Cammon territory not border Port-de-Paix and do the sea route change. Hmmm.. Interesting dilemma... what do others think? I nearly added that you could ignore this comment! It's one of those visual things really... I can see that it's equidistant from the contour lines.. swings and roundabouts really! If you decide to put an explanation about the impassable borders, see if it will fit in that gap somewhere? I don't really have any problem with the attack routes. And in my opinion the rivers are pretty clear as impassables - nice work there. My concern continues to be with the bonuses. As I've said a million times, getting the bonuses right on a small/smallish map like this is tricky, because there is little room for error. In the case of this particular map, all of the regions are either four or five territories. I like this because there won't be that one player in every game who gets to collect the first bonus because he happened to start with most of the smallest region. However, there's a good change that the first bonus given in games on this map will be a +4 or +5 because those regions aren't any harder to conquer than the other regions. They are harder to hold, but a lucky roll early and the game is over before anybody else can get it together. And maybe I'm being over-cautious... somebody tell me if I am. oaktown wrote: And maybe I'm being over-cautious... somebody tell me if I am. what if everything was lowered by one? edbeard wrote: what if everything was lowered by one? Interesting, hm, I'm not sure if that makes it any better. If you don't lower everything by 1, I'd make Quest a 4 instead of a 5. I think it would still have quite a bit of value, due to the island being a shortcut around the map. well I'd need another territory because there's 28 right now. I'd rather the drop from 3 player to 4 player didn't go from 9 to 6 starting territories. what if I added four territories to the map? if Nord and Ouest had 8 and 7 territories to conquer, the bonuses would make more sense. You wouldn't be able to conquer a 5 territory continent and get +5. The only problem is fitting them on the map. I can easily do one more on each of them. One above La Finca so that when you take it over, it borders Fort-Liberte and Limbe. Another in between Montrouis and Manneville done so as not to add any more borders. Maybe 2 more territories would be enough to calm any worries about the bonuses? That'd put the total at 30 which is a nicer number than 28 I think. Not as good as 32 though. The bigger continents would require 6 or 7 to conquer. The smaller ones would require 4 or 5. Does this help Oaktown? personally I prefer seeing some variety in region size on a map to avoid the really good drops, so adding a territory or two here and there might not hurt, but i don't want you to have to completely redesign your map trying to do it. Your call ed. I think that a smallish map with generally high bonuses can work, so just lowering all of the bonuses isn't necessary. Gimil's Portugal map is a good example of such a map that plays well, the difference between that and this map being the variance in region sizes. I think it'll be a close call in terms of whether bonuses will actually work, but I think adding the two territories (one to each of the largest regions) will make a difference. taking over 4 or 5 is just going to be easier than 6 or 7. sure sometimes someone will get that bonus first but that's part of the map. no matter where you start, you have a good shot. you might even only be able to hold it for one turn since other players could be only one turn behind you getting their bonus. you can't stop three bonuses all at once. the big difference between portugal and this map is the territory size. 6 territories makes a huge difference when we're talking 36 vs 30. If I want 6 bonus regions, I can't make them too large. That's another possibility. Total redesign of the map to have 5 regions. Maybe someone can look at the regions on the map below and think of a good way to do it. Believe me when I say I've tried but failed. I think keeping with what I have already is the best way. It's hard because of the north/south split and one area will be crowded and the other relatively uncrowded. You could split that map into five like this: 7 and 5; 6 and 2; 1; 8 and 9; 3, 10 and 4. Basically, cut 6 off of the north bonus and merge it with 2. Not vastly different than what you have, but I think it makes it slightly better. I did this 2 weeks ago but didn't feel like updating 'till now. 2. changed a bunch of names. I found a different map of the country and changed some names to major cities. 2. change XML names to match new territory names and change centering since a few circles moved.